It’s a new year, which means a lot of change and objective setting is occurring to realign business strategies for success. When it comes to recruiting great talent, there are always new ways to try to fill positions quickly, and cost-effective manner. January is a perfect time to refresh old methods with these seven tactics for recruiting the best talent. No two employers are the same. From their business philosophy to their daily work environment, every organization is distinguished by a culture that makes it unique. Job seekers are more concerned with the culture of a company than ever before, and a clear representation of the company’s goals, values, and employee work-life balance will speak volumes. Not only does a magnetic culture engage talent, but it also ensures that companies are hiring the right people for that organization. Translate culture into an employment brand that engages candidates and locks in quality employees for the long haul. Attracting job seekers in a competitive market requires employers to stand out with an attractive career site and social media presence, driven by a meaningful employer brand. It starts with creating a consistent message about the company’s culture that excites job seekers to want to become employees. Sure, simply listing out company values and stating benefits is helpful, but 90 percent of job seekers find the employee perspective most useful to learn about a company. Providing a creative video that highlights specific volunteer efforts, or a testimonial that reaffirms the value of becoming an employee will resonate with job seekers in a more personal way. Content that drives a sense of belonging is a result of a truly impactful employer brand. Once the employer branding has captured the interest of a job seeker, the last thing an employer wants is for the application process to fall short of expectations. If an application is difficult to complete, lengthy, or cannot be completed on a mobile device, great candidates may be lost. More than 1.8 billion people now have smartphones and 40 percent of job seekers use them to apply to jobs. Imagine how you can expand your reach by simply automating the application process and allowing job seekers to search and apply for jobs right from their phones, while simultaneously providing an experience that keeps them excited about the company and the opportunity for employment. Your dream candidates may not be ready to apply just yet, so it is essential not to rule out passive talent. Instead, keep these candidates in mind by creating talent pools, organized by factors such as skillset, interest level, or department. By segmenting passive candidates, employers can create personalized content for regular communication to maintain their interest in the company. To keep passive talent engaged, it is important to use relevant subject lines that grab attention quickly, and a call to action such as “learn more about us”. Once a job becomes available, simply reach into your back pocket and pull from an established pipeline of qualified talent. As applications begin to flood the system, and pipelines grow with talented individuals, recruiters must narrow a ton of impressive resumes, down to a core group of potential employees. Between 50 and 70 percent of applicants aren’t qualified for the jobs they apply for, making new screening methods even more important for bringing in the right people. Fortunately, employers have paired up with video technology for a creative approach to enhancing the selection process. 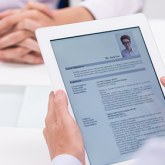 The common misconception is that technology has made us less personable, but 63 percent of recruiters said a video resume or cover letter would give them more insight into whether a candidate would be a good fit within their organization. Once a hire is made, employers should be thinking about how to set that individual up for success. With 90 percent of employees making the decision to stay within the first year, it’s more important than ever to place new hires on the right path with a formal onboarding program. A successful program provides new employees with all of the resources required to become a fully immersed member of the workforce and makes filling out forms and organizing tasks simple. Not only will onboarding help to retain employees for the future, but it will reaffirm their choice to accept a job offer at your company. 7. Once You Have Great Talent, Use It! Where one great employee is found, others are right around the corner. Employee referral programs allow employers to reach more talent from a trusted source. Many companies are using programs such as social distribution, allowing employees to automate pre-loaded messages regarding job openings to their professional networks. Referred employees tend to be better cultural fits that align well with the company and stay longer, reducing time-to-fill. With $4,000 being the average amount U.S. companies spend to fill an open position, offering a little incentive to employees who can work their networks for quality referrals can be the key to big savings and great talent. Eager to learn about even more ways you can revamp recruitment and hire the best talent this year? Take a look at R.I.N. G in the New Year with a New Approach to Hiring in 2017.